The Walking Dead already broke records with its Season 4 debut and topped the Nielsen Twitter and GetGlue charts. It was also the Number 1 cable broadcast for the period of October 7th through 13th and it beat out everything on the broadcast nets rating-wise with the exception of Sunday Night Football. 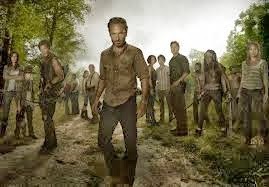 If that wasn’t enough, a repeat of the Season 3 finale on Sunday night was the sixth most watch show on cable for that period and the discussion show The Talking Dead which followed the Season 4 premiere ranked at Number 12 among cable shows. It doesn’t show up in the DVR numbers below, but those are on a delay and represent activity for the period of September 23rd through 29th. When we do get the DVR numbers for The Walking Dead’s premiere week, it wouldn’t surprise me if it tops that list as well. That franchise has become a powerhouse for AMC and it could help unseat the broadcast networks long reign over the Prime Time hours on television. An additional note on the numbers below: all three of the broadcast network genre shows in the Top 25 actually slipped with their ratings for the week, yet moved up in the rankings. That indicates an overall drop in viewership on the broadcast nets for the week but a gain for those shows in relative audience. Cancellation Watch: Ratings Decline for Agents of SHIELD Slows, but Could a Shake-Up Still be Coming?